Hi there, is there a way to recover the deleted Whatsapp Photos on iPhone? Actually, my neice was playing with my iPhone and after a while when I took my phone back, I found she might have unintentionally or accidentally deleted some chats which I have with my friends and family. How can I get them back? I really need the deleted WhatsApp photos which are all about my family and even my grandmother who has passed away. Waiting for a helpful response. Thanks! WhatsApp messaging app is one of the most downloaded apps across the globe today. iPhone users have embraced this app and use it to send messages, photos, videos and other media files to friends and relatives. At one point for various reasons, you may lose some important WhatsApp photos accidentally. This is bad, but it is even worse if you don't know how to retrieve them. Fret not, in this article we will show you how to recover deleted photos from WhatsApp on iPhone without or from backup. 1. Can You Recover WhatsApp Deleted Photos on iPhone without Backup? 1 Can You Recover WhatsApp Deleted Photos on iPhone without Backup? Well, the answer to the question is quite simple. "YES, it can be recovered". If you cease your iPhone from any usage immediately after a data loss scenario and bring a data recovery tool in action to recover your lost data, chances are that you may be able to recover almost all your data. If in case you continue using your device after experiencing data loss, chances to recover data in such a case are highly diminished. Why? Well to understand this, let's get to know how can the deleted data be recovered. Basically, all your data saved on your iPhone is stored using SQLite database. Now, if you delete any of your data like photos, videos, messages or any other data – be it intentionally or unintentionally – it is not removed or erased immediately from your iPhone. Instead, the space consumed by that data is marked as "Free" or "Available". That means your data is still within your iPhone but in the hidden state. Here comes the data recovery tool handy. The data recovery tool finds out the hidden data and makes it visible again. That's to say, if you continue the use of your iPhone, the new data gets stored onto the hidden data's storage location. Hence, the hidden data gets overwritten which also diminishes the chances of its recovery to a huge extent. If you are caught off guard without a backup in iTunes or iCloud, you can still scan your iPhone and recover the deleted WhatsApp photos. A tool that can powerfully do this for you is iMyFone D-Back iPhone data recovery. 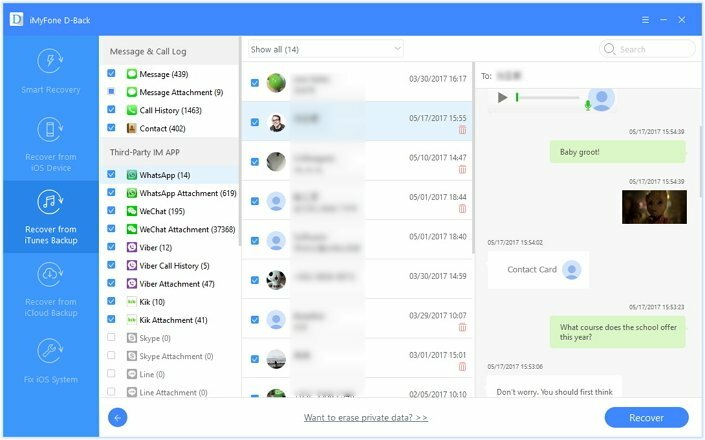 This tool recovers WhatsApp data, including photos, videos, messages and audios, lost on your iOS device. Before we look at how to use this software, we have highlighted its key features. Supports to recover WhatsApp photos, videos, audios and texts on your iPhone. Besides, it can recover 18+ data types like text messages, voice memos, contacts, notes and more from iPhone if you accidentally deleted them. It offers free trial version that you can use to preview data before recovery. Recognized by Cult of Mac, iMyFone D-Back is reliable and has helped millions of iOS users to retrieve data. Supports iPhone (iPhone 8 and iPhone X included), iPad and iPod touch running iOS 11/10/9/8/7, even the latest iOS 12. When you have downloaded the software to your computer, you can follow these easy steps. Run iMyFone D-Back and select "Recover from iOS Device" tab on the home window. After that click on "Start" and select the file types you want to recover. Here you choose WhatsApp. Next you will have to connect your iPhone to the computer using a USB cable. 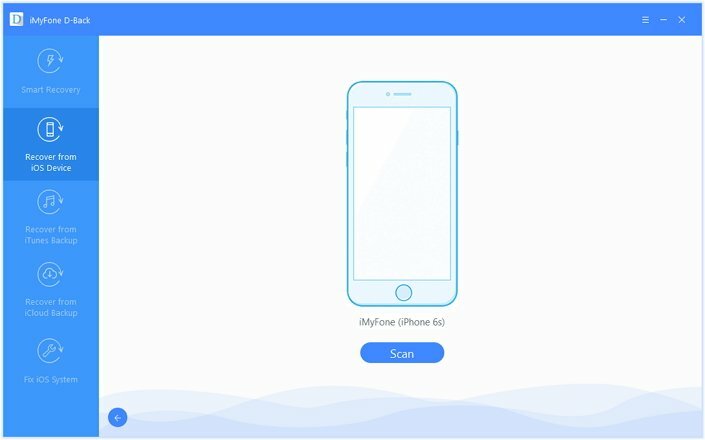 When your iPhone is detected, click "Scan" and iMyFone D-Back will start to scan your iPhone. It will take a while, which depends on the storage of your iPhone. After scanning has competed you will see the selected file types being displayed. Go to WhatsApp Attachments and view what has been found. Also, check the App Photos to confirm whether there is any photo you may want to recover. Next, mark on the photos and click on Recover. The photos will be stored on the folder you create on your computer. 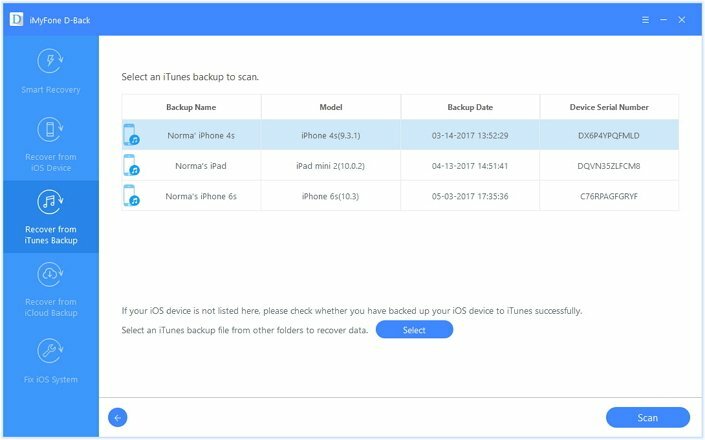 Being the standard data backup & restore tools, iTunes and iCloud are powerful enough that not only can back up the existing data on your device but also backs up the deleted data on your device too. However, the deleted data is also stored in hidden form and the users cannot access or see it even after restoring the backup. 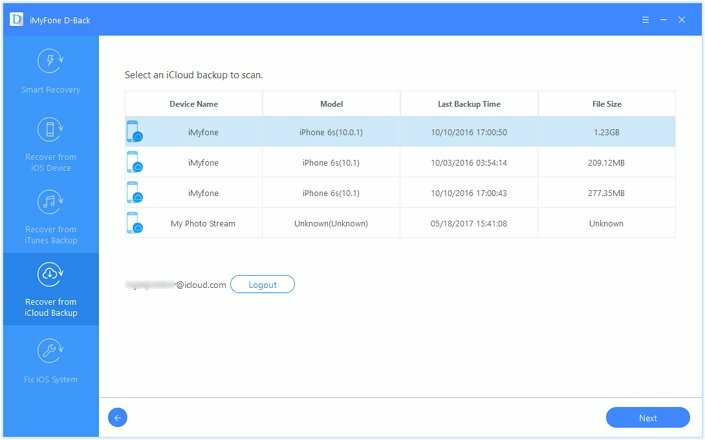 iMyFone D-Back, a powerful and professional iOS Data recovery tool that enables the users to access and preview both the existing as well as the deleted data files in iCloud or iTunes backup within a few simple steps. If you are sure that you have backed up your WhatsApp to iCloud before you deleted the WhatsApp photos, you can just restore the WhatsApp backup from iCloud. If you've enabled iCloud Backup in settings, you can use iMyFone D-Back to download and scan your iCloud backup in order to find the deleted WhatsApp deleted photos. You can recover WhatsApp chat history if you have backed up your WhatsApp messages to iCloud. Here is a simple way to do it on your iPhone. Step 1. Open WhatsApp app, and then go to WhatsApp Settings> Chats> Chat Backup and see the date of last backup. Step 2. Now go back to home page and delete the WhatsApp app. Hold on it and click on "X" icon on it. Then confirm by clicking "Delete". Step 3. Go to App Store and reinstall WhatsApp. Enter your phone number and confirm it on the next step and then tap on "Done" icon. After that tap on "Restore Chat History". The restoration process will commence. Once it is completed you will see the number of messages it has been restored. 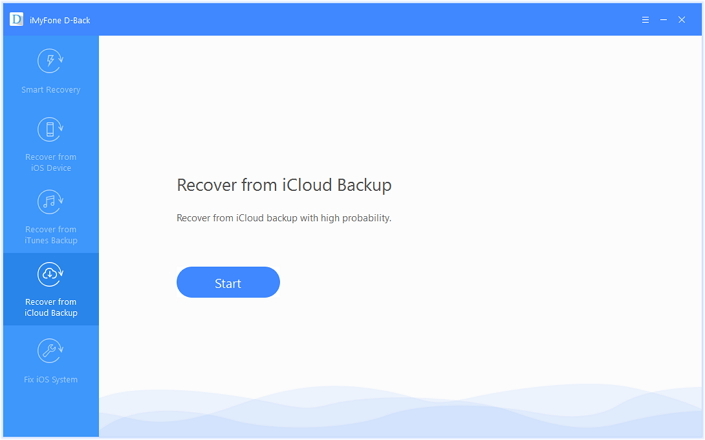 Open the software and click on "Recover from iCloud Backup". What follows is to select file types and then log in to your iCloud account. On the iCloud account, select the appropriate backup file and click on "Next" button. Once the backup file has been downloaded and displayed, you can now go through the photos and other files. Mark on the WhatsApp photos you wish to recover and click on "Recover" button. The files will be recovered on the specified folder on your PC/Mac. If you have backed up your iPhone using iTunes before, you can just restore your iPhone from the backup. There is also another choice. As explained previously, iTunes backup also contains the deleted data, so you can use iTunes to back up your iPhone after deleting the WhatsApp data and then use iMyFone D-Back to find out the delete WhatsApp photos. Step 1: Open iTunes on the computer which you used to back up your device. Step 2: Connect your device to the computer with a USB cable. Step 3: Select your iPhone when it appears in iTunes. Click Restore Backup and follow the onscreen instructions to finish the process. You can also use iMyFone D-Back iPhone data recovery Win or iPhone data recovery Mac to selectively extract deleted WhatsApp pictures from your iTunes backup that you newly made. Launch the software and choose "Recover from iTunes Backup". Next choose the file types you wish to restore and click "Next". After that a window appears with backup files. Click on the suitable file and click on "Scan" button. Now go through the photos found. 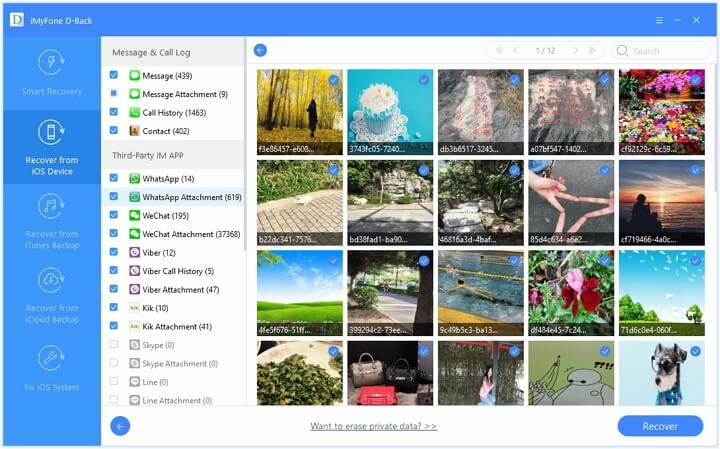 Check on WhatsApp attachments, App Photos and Photos to see the files you want to restore. Check on each photo and click on "Recover." The WhatsApp photos then will be saved on where you define on your computer. The Free Trial version of iMyFone D-Back iPhone data recovery is available to download now. Give it a try! Something unexpected can catch you anytime like the user mentioned in the question. Accidental deletion of WhatsApp photos or other data are normal. If you have a backup of your data on iTunes or iCloud you may not have to bother about data loss. The only thing that will bother you in such a situation is how to selectively restore data from iTunes or iCloud backup. 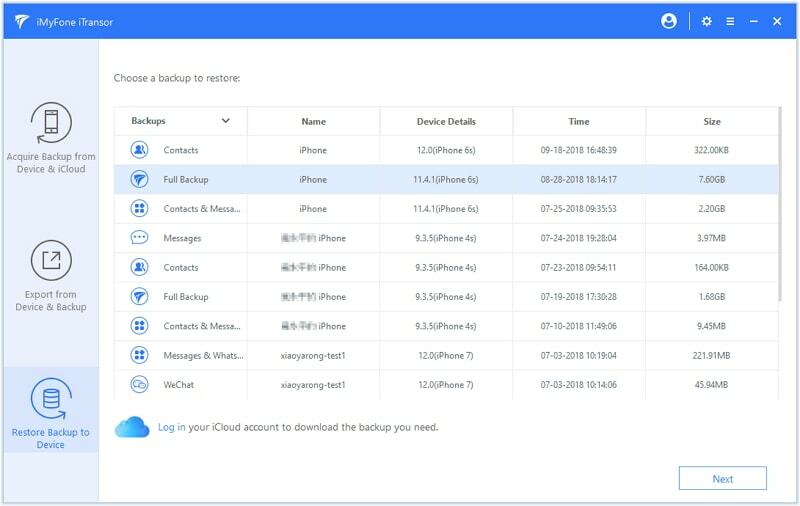 This is because of the known fact that iCloud or iTunes will over write all your current data with the backup file once you restore the whole backup, and they don't allow you to restore data selectively. Although iCloud allows you to restore only WhatsApp data, the other types of data cannot be restored separately. 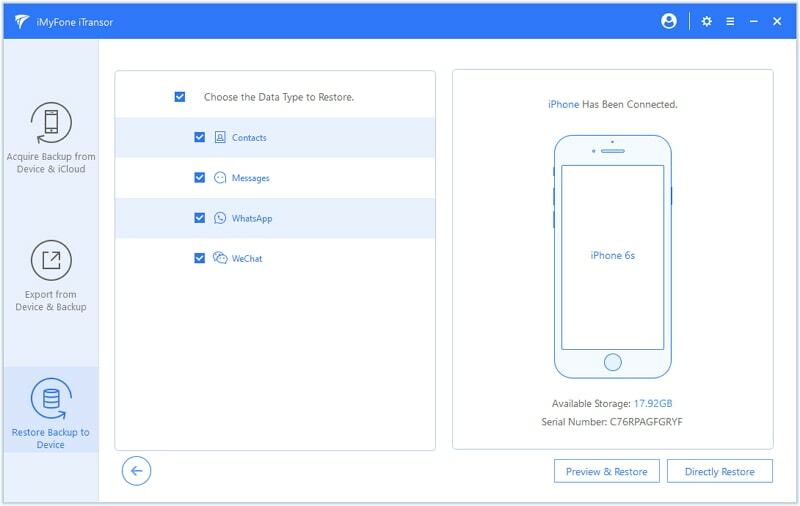 Here comes the tool, iMyFone iTransor, which can powerfully restore only the WhatsApp data back to your device from an iTunes or iCloud backup without overwriting any other data. With this renowned software you can restore data both selectively and completely, depending on your needs. 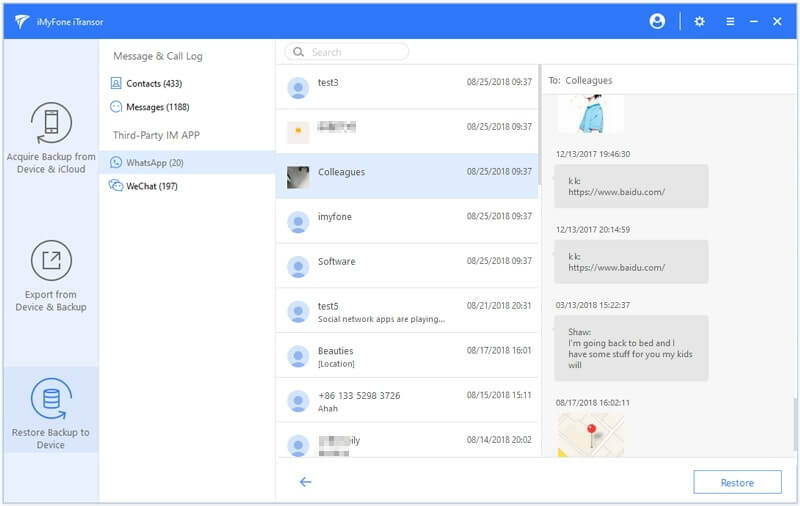 Another amazing flexibility that this software offers is it enables to the users to preview the data selectively prior to restoring it to their device. iMyFone iTransor is extremely user friendly and supports flexible backup and restore of over 20+ data types. Let's now understand how to selectively restore WhatsApp data from iTunes or iCloud Backup. Step 1 – Get the official iMyFone iTransor software and install it on your computer. Launch the software post installation and meanwhile, connect your iPhone to your computer using a USB cable. Step 2 – From the home screen of the software, hit on "Restore Backup to Device" tab from the left menu panel. A list of all the backup files will load up on your screen, select the preferred iTunes backup from which you wish to selectively restore deleted WhatsApp Photos and hit "Next". If you want to restore from iCloud backup, you can choose "Log in" your iCloud account and download the iCloud backup first. Step 3 – Now, you are required to hit on "Restore Partial Backup" to restore data selectively. Then select the data type that you wish to restore, i.e. "WhatsApp" and hit the way you prefer to restore. Choose "Preview & Restore" to continue. Note: If you clearly know the WhatsApp content in the backup then you can choose "Directly Restore". Step 4 – Lastly, after previewing your data, hit on the "Restore" button at the bottom right corner to initiate the restoration process.